IMX Software announced today that it has concluded an agreement with Travelex Africa Foreign Exchange to replace its existing foreign exchange trading system with GTS-Retail. Travelex Africa has signed a five-year agreement to implement IMX Software’s market-leading point-of-sale trading and regulatory compliance solution, GTS-Retail, together with the leading real-time sanctions and PEP checking service from ComplyAdvantage. IMX Software is the global leader in currency trading and travel money technology. Travelex operates 38 branches across South Africa including OR Tambo International airport. In January, the South African assets of Travelex were purchased by Tourvest Financial Services – an existing GTS-Retail client – increasing Tourvest’s branch estate to 87. Tourvest has prioritised the rollout of GTS-Retail in Travelex to gain the operational and compliance advantages the GTS platform provides. The project is being fast-tracked to achieve go-live across all Travelex branches by 1 April this year. GTS-Retail is tailored to the highly specific needs of the South African market, with compliance modules for South African Reserve Bank FinSurv reporting as well as integration with the Financial Intelligence Centre’s goAML software for reporting of larger cash transactions, suspicious transactions and international fund transfers. In addition, Western Union and MasterCard integrations eliminate dual capture of transactions, and the embedded International Reference Systems’ banknote verification service allows tellers to verify banknote security features for all currencies. Al Baraka Bank, the pioneer of Islamic banking in South Africa and a subsidiary of the international Al Baraka Banking Group B.S.C, has deployed IMX Software’s new generation foreign currency point-of-sale and trading compliance solution in all its branches across South Africa. A key requirement for Al Baraka was to efficiently manage foreign banknote availability across its national network in order to service its customer needs whilst optimising cash holdings. Al Baraka has experienced strong growth in foreign banknote sales and needed to replace its existing system to enable faster transaction times and significantly improved inventory management and back-office reporting. Furthermore, the Bank plans to launch a remittance product in the future – a strategy GTS supports through out-of-the-box integration with the major remittance operators: Western Union, MoneyGram and Xpress Money. GTS-Retail is a modern, easy-to-use, multi-language point of sale system enabling forex providers to serve customers quickly, while efficiently managing their compliance obligations and inventory. Centralized administration and reporting provide a clear view of business performance and ensure that trading, AML, KYC and other business-specific rules are enforced. GTS-Retail is highly tailored to the specialist needs of the South African market, with compliance modules for South African Reserve Bank FinSurv reporting as well as integration with the Financial Intelligence Centre’s goAML software for reporting of larger cash transactions, suspicious transactions and international fund transfers. Says Rob Stansell, Managing Director of IMX Software SA: “We are delighted to have Al Baraka as the first South African bank to use the GTS trading platform. We look forward to assisting Al Baraka to launch new products on the GTS platform in the future”. P&O Ferries, the leading cross channel ferry operator with the largest UK fleet of ships, has on-boarded IMX Software’s new generation foreign currency point-of-sale and trading compliance solution under a five-year managed services agreement. A key consideration for P&O was to be able to trade ‘offline’ while sailing and to reliably synchronise trading and reference data upon reconnection in port. The project has seen IMX Software’s GTS-Retail software solution implemented on board the entire P&O fleet of 15 ships; servicing routes across the North Sea, the Irish Sea and the English Channel. The implementation of GTS is expected to drive growth in retail foreign exchange sales to customers through faster transaction times with significantly improved back-office reporting and inventory management. The ferry operator selected IMX’s Software-as-a-Service (SaaS) offering to minimise internal IT impact, whilst integrating with P&O’s current IMX Reserve&Collect service which enables customers to pre-book currency through its website for on-board collection. GTS-Retail is a modern, easy-to-use, multi-language point of sale system enabling forex providers to serve customers quickly, while efficiently managing their compliance obligations and inventory. Centralized administration and reporting provide a clear view of performance and ensure that trading, AML, KYC and other business-specific rules are enforced. IMX Software is the global leader in currency trading and travel money technology. P&O Ferries, voted Best Ferry Company and Favourite Ferry Company by consumers at the Globe Travel Awards 2016, 2017 & 2018, already has a strong on-board Foreign Exchange business but needed to upgrade the technology platform to the latest standards of security, AML/KYC processes and reporting. IMX Software’s SaaS-based solution will help P&O Ferries boost transaction turnover and lower internal operating costs, allowing better management control and optimisation of stock levels. The solution will enable P&O to improve accuracy and speed up transaction times at the point of sale. Infinea Group, a diverse global technology and FinTech services group, today announced that it has completed the 100% acquisition of UK-based IMX Software Group in a deal that adds fintech and regtech products, and a list of long term, blue-chip banking and money service clients to its portfolio as well as adding established London, UK and Melbourne, Australia locations. IMX solutions are deployed globally in major banking and money service organisations including Thomas Cook, American Express, ANZ Bank, Bidvest, Credit Suisse, Commerzbank, RBS Group, Moneycorp, Change Group, Rand Merchant Bank, FOREX Bank, Travel Money Group and the Central Bank of Zambia. Following the transaction, the head office of Infinea Group will move from Johannesburg to London in order to facilitate growth in overseas markets including Europe and the USA. Nacelle: a joint venture with Comair Ltd, one of Africa’s leading airline and aviation services groups, and owner of the regional British Airways franchise as well as low cost carrier Kulula.com, and regional aviation support companies. Nacelle operates all of the technology services, digital development, ground-side and air-side technology operations for Comair and its brands, and owns all airline and payments IP developed by one of Africa’s most successful airlines. InfineaPay: a modern payments provider created to allow every member of society to participate in digital commerce, with technologies to power issuance, acquiring of e-commerce, as well as multi-tiered payments models. InfineaLabs: provides all engineering and dev-ops services for all brands in the Infinea Group, and also makes its services available to outside customers at competitive rates, delivering modern, customer oriented, technology solutions from a wealth of talent and proven technology to a broad range of industry sectors. As a result of this transaction, the IMX Software brand will be expanded upon, with the current executive management team remaining in senior roles within the new Infinea Group structure. As part of Infinea, the IMX Software team will be able to access new investment, incremental technical resources, new global markets and an advanced 24/7 software and services support organisation. Imali Express and Tower Bureau de Change have signed five-year, software-as-a-service agreements to migrate from their existing TMX implementations to GTS-Retail from IMX Software, the global leader in currency trading and travel money technology. 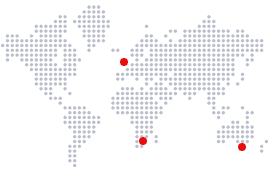 IMX has tailored GTS-Retail to the needs of the South African market, with compliance modules for South African Reserve Bank FinSurv reporting as well as integration with the Financial Intelligence Centre’s goAML software for reporting of larger cash transactions, suspicious transactions and international funds transfers. In addition, recent changes to South African Reserve Bank regulations require authorised dealers with limited authority (ADLAs) to better uphold sanctions and PEP screening against customers. To meet this requirement, GTS is now fully integrated with ComplyAdvantage, the world’s only provider of AI-driven AML risk data, allowing for real-time screening of customers against global sanctions and PEP lists. These new features will help ADLAs using GTS meet their statutory obligations and prevent breaches of regulations. African central banks will find this case study on the adaptation of GTS-Retail for the Bank of Zambia’s AML initiative relevant to the regulation of their own bureau de change industries. IMX Software has completed the rollout of a centralized, real-time system that allows the Bank of Zambia to monitor foreign exchange transactions processed by all licensed bureau de change operators across the country. Download the full case study here to read more.